A Tiangong 1-like unidentified flying object was spotted by a group of visitors when visiting the Phoenix Mountain scenic spot in Heilongjiang Province around 3:42 pm July 8. A Tiangong 1-like unidentified flying object was spotted by a group of visitors when visiting the Phoenix Mountain scenic spot in Heilongjiang Province around 3:42 pm July 8. This mysterious scene was captured by a professional photographer who was taking the visitors' photos. The object vanished rapidly after a streak of white light was detected. The witnesses reported the case to local police station after the sighting. Relevant local authorities have already been informed. For now, the UFO's identity remains shrouded in mystery and needs to be investigated. This is not the first UFO case occurring near Phoenix Mountain. 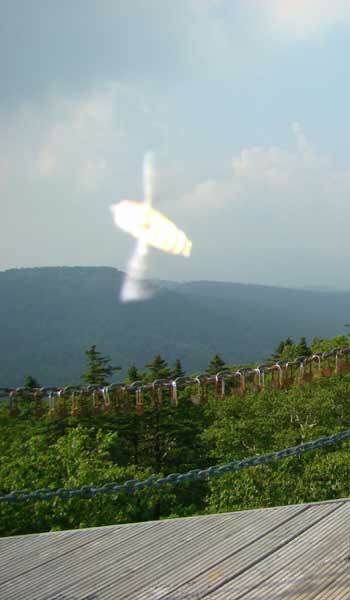 Last Sunday's scare mirrors the famous UFO extraterrestrial contact events in 1994 when a villager named Meng Zhaoguo claimed that he had been repeatedly contacted by aliens and had been shown around a UFO base. The incident attracted worldwide attention.